My sister-in-law, Alison aka Italian Goddess, made this sweat cream bell pepper pasta sauce for me, with two babies hanging off her hips. It was so good I requested the babies and the sauce recipe. She gave up only the recipe. Let’s begin with the three ravishing bell peppers. Red, orange, and yellow. You can make due with any combination of the three, but the variety gives it something extra special. Saute in sauce pan with a little garlic, olive oil, salt and pepper, and 1/4 Cup water. Have giddy girl stir until softened and flavor releases. About 15-20 minutes over low-medium heat. Alison added cream, I used milk and it still tasted delicious. 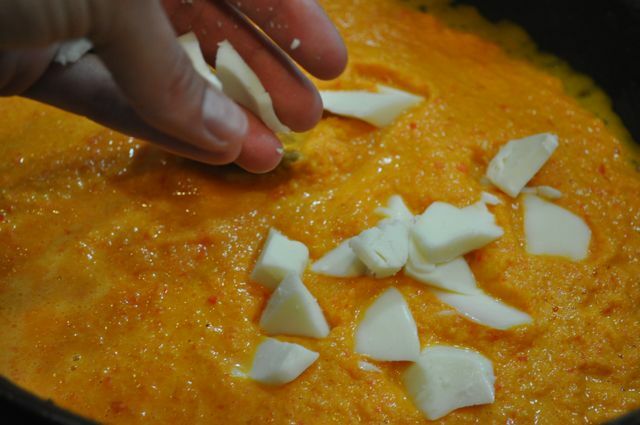 add 1/4 Cup Mozarella chunks. Stir until melted in. 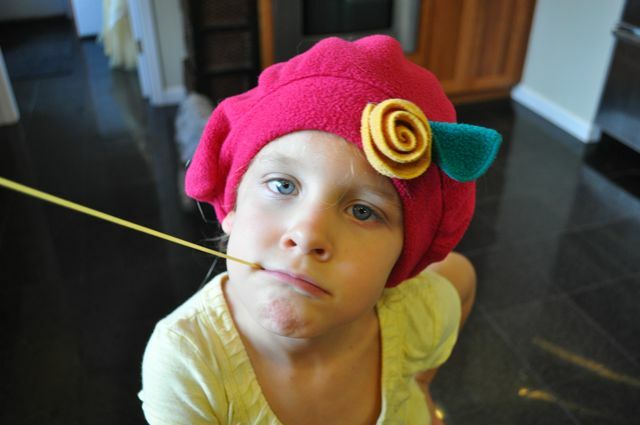 Shall we boil the pasta now, matey? A few beautiful basil leaves will garnish your pasta nicely. Parmesan cheese adds something extra nice. Crusty bread on the side? Yes, please. 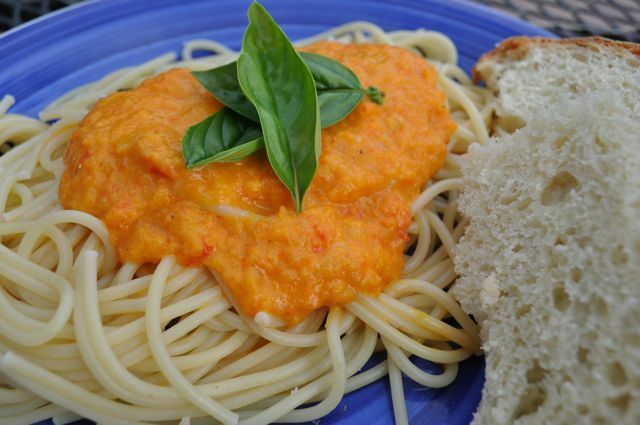 Spaghetti is not my first choice for this sauce, but meal planning can be so cumbersome, can’t it? Rigatoni, penne, and corkscrew works beautifully. 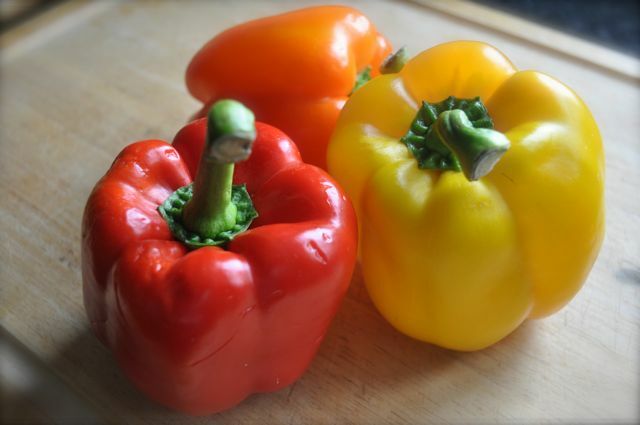 Bell peppers contain an impressive list of plant nutrients that are known to prevent disease and promote health. Very low in calories and fats, the sweet bell pepper is rich in Vitamins A and C, especially concentrated in the red pepper. 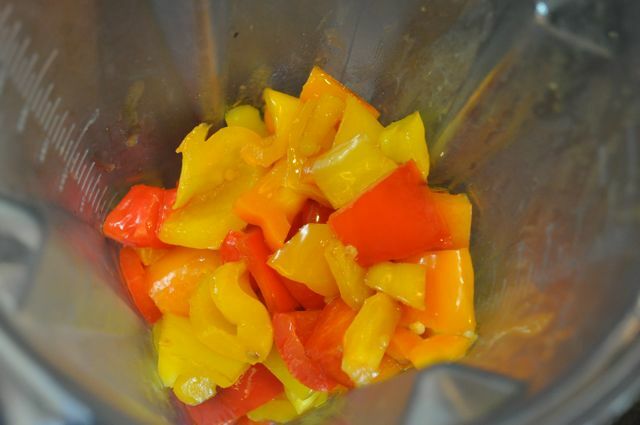 The bell pepper also has good B vitamins and minerals, essential for good health. Simple. Delicious. Heart-Healthy! 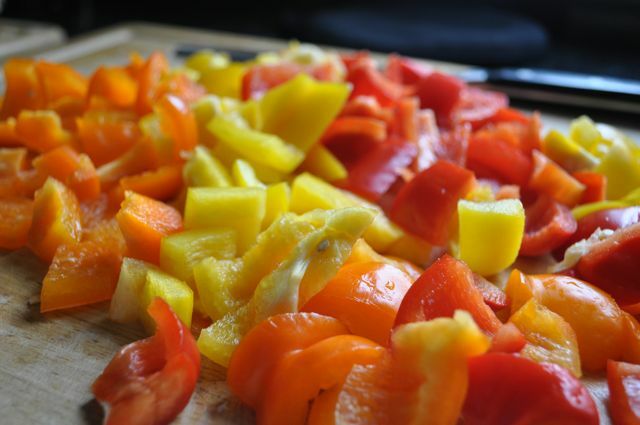 Bell peppers contain an impressive list of plant nutrients that are known to prevent disease and promote health. Very low in calories and fats, the sweet bell pepper is rich in Vitamins A and C, especially concentrated in the red pepper. 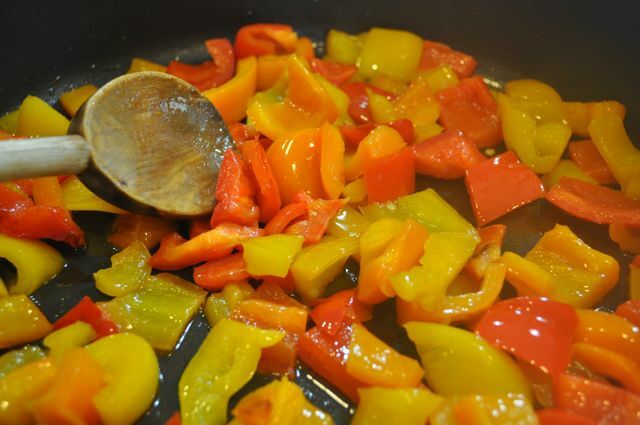 The bell pepper also has good B vitamins and minerals, essential for good health. Pour back into sauce pan, add milk & mozarrella chunks. 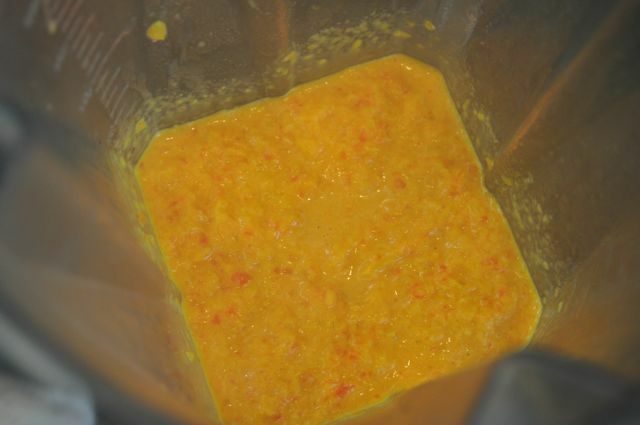 Stir until warm and thoroughly blended. P.S. Looking forward to fall running or perhaps a clearance swimming suit? Albionfit.com, a great women’s athletic apparel company is generously offering $10 off any order when you use the promotional code: Maisy10. Good through MONDAY, 9/23/13. 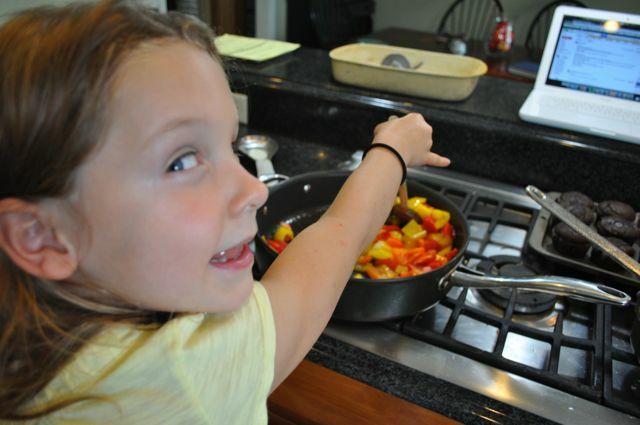 This entry was posted in Food, health, Recipes, runner food, Weekend Recipe, yum-yum on September 20, 2013 by maisymak. Can’t wait to try this. We are trying to eat more plant based foods and this sounds wonderful. Just planted our capsicums for the summer ahead. 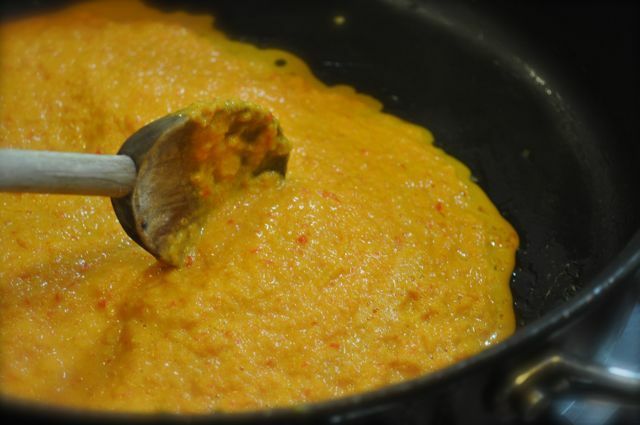 Nice sauce – we love our peppers mostly raw but this makes a nice change and still with all the goodness. Looks delicious! Thanks for the “low fat” version- milk vs. cream. Also, love the digital recipe card. Perfect for pinning!!! That looks delicious to me!